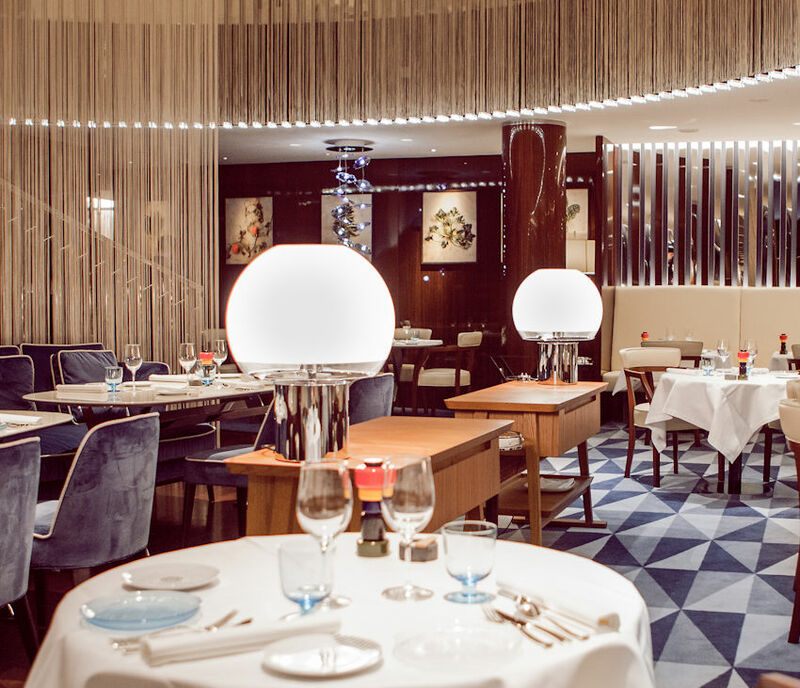 Alain Ducasse is championing his protégé Chef Alexandre Nicolas who is at the helm of the restaurant. Executive Chef Alexandre Nicolas’ menu incorporates the classic flavours and vivid colours of the Riviera, with a focus on simple creations and the best ingredients, particularly vegetables. Alongside a myriad of local produce, specialist products including cured meats and olive oil from Italy are part of the experience. We are delighted to share with you his recipe for Rivea’s signature starter dish, Rivea Salad. Add the chick-pea flour to a bowl and whisk in the water, salt and olive oil. Let the mixture rest at room temperature for 1 hour. Wash the vegetables and salad. Chop the lettuce into 1 cm strips starting from the top of the leaves and working your way down. Cut the red pepper, cucumber and fennel, into sticks of 1cm x 3cm. Cut the tomatoes into quarters. Pick the leaves from the basil and the parsley, roughly chop them. Place the eggs in a pan of cold water and bring to the boil. Simmer for 10 minutes. Cool down the eggs under cold running water. Peel them. Cut the eggs into 1/2 cm slices. Drain the olives, tuna, anchovies on to a paper towel removing the excess olive oil. Cut the olives in half. Roughly chop the tuna and the anchovies. Carefully mix all the ingredients in a bowl. In a hot non-stick, 22cm diameter pan, pour a dash of olive oil. Pour in a ladleful of the chick-pea batter: It should be the same thickness as a French crepe. Cook until you see the top of the socca beginning to bubble and the bottom turning golden brown. Place the pan in the oven at 220° for 3 minutes to cook through. Remove the pan from the oven and turn over the socca. Return to the hob and sear it for 30 seconds. Repeat for 8 socca. Do not place them on top of each other. Season the garnish with olive oil, lemon juice, salt and pepper to your preference. Place the garnish on the warm socca, wrap it. Season again finally with pepper. Serve 2 warm garnished socca per person. Having spent more than ten years under the tutelage of Alain Ducasse in London and Paris, French chef Alexandre Nicolas is the natural choice to head-up the Rivea kitchen. Drawing on his experience of working with the freshest garden, market and artisan produce, the chef is translating his personal passion for this honest, simple cuisine using the best of British and Mediterranean produce, with an emphasis on vegetables. Alongside traditional recipes, he places his own personal interpretations on this vibrant, colourful cuisine with one of his culinary trademarks being the creation of pesto and condiments to accompany his dishes. The Member Club Offer: Members dine complimentary when dining with at least one or more guest when having lunch Monday to Saturday and dinner Sunday to Saturday – until 2nd October 2017. Click here to book or for more details.